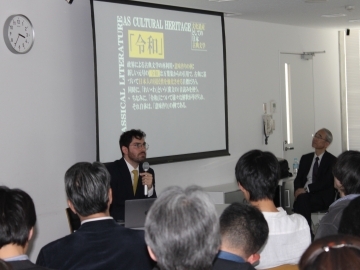 This lecture was sponsored by Waseda University’s Global Japanese Studies Model Unit of the Top Global University Project and co-sponsored by the Waseda University Research Institute for Letters, Arts and Sciences and the Ryusaku Tsunoda Center of Japanese Culture. 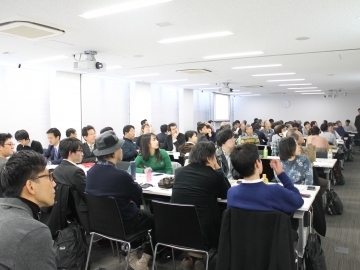 It drew numerous attendees, including researchers from Waseda University and other institutions, as well as other faculty members and students. 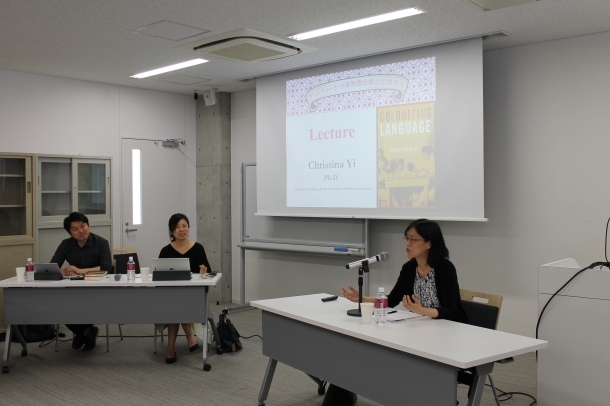 This lecture was held to commemorate the publication of University of British Columbia Assistant Professor Christina Yi’s book Colonizing Language: Cultural Production and Language Politics in Modern Japan and Korea (Columbia University Press, March 2018). The event started with opening remarks by Waseda University Professor Hirokazu Toeda. 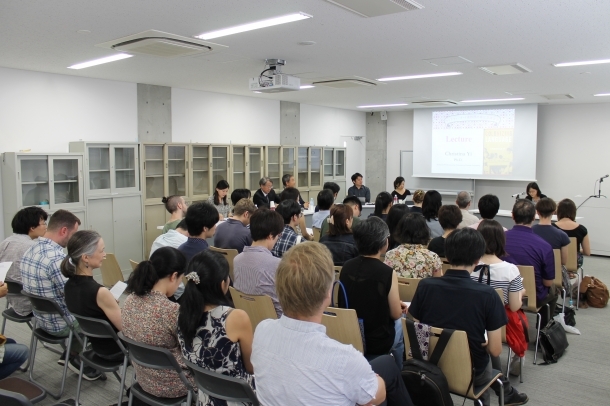 Professor Toeda explained the purpose of the lecture and introduced Yi, as well as Nihon University Professor Ko Young-ran and Tokyo University of Foreign Studies Senior Assistant Professor Akito Sakasai, both of whom served as commentators. Yi received her doctorate in modern Japanese literature from Columbia University. 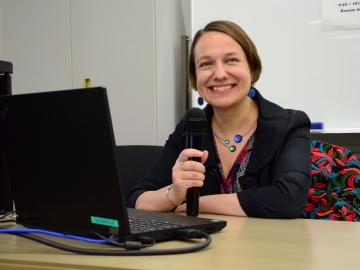 Her research topics include Japanese-language literature by Koreans during the 1930s and 1940s—part of Korea’s colonial period under Japanese rule—and “national literature” and “ethnic minority literature” in post-War Japan and Korea. The two commentators share close areas of expertise: They conduct research into both modern Japanese literature and literature by zainichi Koreans living in Japan. Yi began her lecture with an explanation of her goal in writing Colonizing Language: Cultural Production and Language Politics in Modern Japan and Korea and an overview of the book. The rest of her talk focused on the fourth chapter of the book, which deals with the period immediate following Japan’s surrender in World War II. 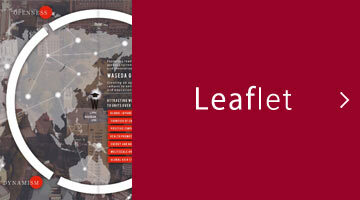 The book, which interrogates Japanese-language literature by Korean and Japanese writers from the 1930s through the 1950s, considers a vast set of sources and demonstrates a clear awareness of the issues that it explores, based on an exploration of the intersection between linguistic nationalism and national identity. For instance, Chapter 4 brings into stark relief the issues of nationhood, language, and literature faced by writers in Japan and Korea through discussion of the post-War works of Yuriko Miyamoto, Chang Hyŏkchu, and Masako Yuzurihara. After the lecture, commentator Ko Young-ran (Professor, Nihon University) presented a distillation of the significance of Yi’s book. She then noted the necessity of placing literary figures and their works within the political situations of their times, specifically discussing the context experienced by Chang Hyŏkchu in Japan after the outbreak of the Korean War. Professor Ko discussed the political nature of selecting the texts dealt with in academic research. The second commentator, Akito Sakasai (Senior Assistant Professor, Tokyo University of Foreign Studies), described the appeal of the book. He praised it for Yi’s careful approach to argumentation, which was wary of arriving at glibly positive conclusions when deriving criticism from literature, as well as for the meaningfulness and strategic value of reading literary works written in Korea and Japan during the same era together. Additionally, Sakasai asked Yi about her vision for her future research activities following the publication of the book. After the discussions between the designated commentators and Yi, the floor was opened to questions and answers involving the audience. 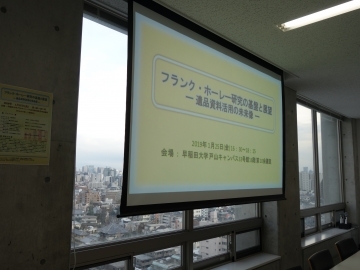 There were a variety of questions and comments, including about the evaluation of Naoya Shiga as discussed in the book and from perspectives such as class and gender. At the end of the event, Waseda University Professor Lee Sung-si used his closing remarks as an opportunity to touch upon the linguistic peculiarities left in Korea after its liberation from colonialism and reaffirmed the perspective presented in Yi’s book. 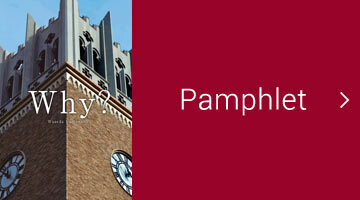 The lecture event then concluded as a rousing success.